CVA® WolfTM .50 Cal. Muzzleloader with Scope Mount. The ultimate predator on the prowl. This particular model comes complete with an integrated scope mount and soft-touch black stock. CVA Wolf .50 Cal. Muzzleloader with Scope Mount is rated 5.0 out of 5 by 15. Rated 5 out of 5 by rongott from Easy transaction Bought this for a friend for Christmas and the muzzle loader arrived fast and shipped secure. I have the same one and it shoots amazing so that's why i bought this one for a gift. Sportsman guide price was lower than anyone else that i could find with the shipping being a couple days. Rated 5 out of 5 by mickey from great quality great quality for price. bought for my grandson for muzzleloader season. it took 4 shots to sight in , and less than 10 minutes to clean. great gun! Rated 5 out of 5 by zach from Great Product and Great Price This muzzleloader is a great buy and just what I was looking for. The gun is so much easier to clean than my Thompsons Black Diamond. Rated 5 out of 5 by joe 63 from accurate accurate Good price, used 2 triple 7 pellets 250 grain sst sabot I know they recommend other bullets but I had the sabots. I went to range as soon as I got rifle. Took 5 shots and I shot under 1.5 inch groups at 100 yards, started at 30 yards an moved taget to 100 yards. Shoots as good as a 600.00 dollar rifle nice an light an balanced. Rated 5 out of 5 by Telemag00 from Very Accurate It's hard to believe you can get this nice of a rifle for under $200.Good trigger, good balance, nice fit and finish and very accurate. I have more expensive muzzleloaders but this is quickly becoming my favorite! Rated 5 out of 5 by Boomer from Fantastic deal. Great price. 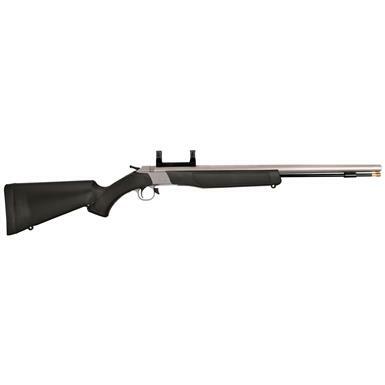 This was a fantastic deal on a quality muzzleloader with a scope mount already attached. I would recommend this for anyone who wants a quality muzzleloader at a very reasonable price. The only downside was it was packed very poorly at SG before it was shipped. Rated 5 out of 5 by Jonathan from Great Muzzleloader A very nice and accurate muzzleloader! Mounted a tasco scope on it and 2 shots later I was shooting a 1/2 inch group at 50 yards. The trigger is very crisp. Easy cleanup with the quick release breech plug. My CVA Wolf liked 90 grains pyrodex rs loose powder with harvester scorpion pt gold 300 grain sabot. Thank you Sportsmans Guide! A name I can always trust and rely on!! !